Background. Rapid growth in the craft beer industry is stimulating Indiana’s economy and creating an opportunity for Indiana farmers to start growing hops. In 2012, the Indiana craft brewing industry contributed over 600 million dollars to the state’s economy. The industry continues to grow, increasing from 63 breweries in 20131 to nearly 100 in 2015, and housing over 6,000+ full-time employees2. Hop production has increased over 10% since 2013, with the hops industry in Indiana being no exception3. Hop production currently occurs predominantly in the Pacific Northwest, with Washington state leading production at (74%) of the total acreage, followed by Oregon (14%), Idaho (10%), and the rest of the country (2%). However, many hop yards have now taken root in Indiana, with many additional yards currently under construction (Figure 1). Hops (Humulus lupulus). Hops are a perennial crop essential for beer production – imparting bitterness and aroma. The plants produce bines that climb over 20 feet during the course of the growing season. 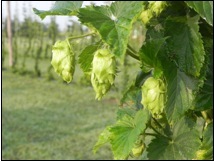 The female cones (flowers) (Figure 2) are harvested in late summer or early fall, and are dried or sent directly to the brewery to begin the process of producing beer. Healthy hop plants have a life span of over 10 years. Purdue’s interaction with the industry. With a rapidly growing industry comes a need for professional assistance through university research and extension. The Specialty Crop Production Systems Research Lab at Purdue is providing that assistance. Entering its second year, the Boiler Hop Yard is home to variety trials that aim to identify best adapted varieties, and key insect pests and diseases affecting hops in Indiana. This summer, the lab will travel to established and aspiring Indiana hop yards to collect soil, pest and cone samples to help farm owners optimize their production systems. Training the next generation of hop growers, researchers and extension educators is another aim of the Purdue Boiler Hop Program, and this summer Clayton Nevins, a senior in Purdue’s Agronomy Department, was hired as an intern to help manage the hop yard and assist with disease scouting and soil analysis throughout the state. In the fall, Clayton will collect cone samples and quantify the essentials oils and alpha and beta acid levels present in the hops in collaboration with scientists in the Department of Food Science. The acids and oils impart bitterness, flavor and aroma in beer. Finally, Clayton will assist with development of extension bulletins aimed at helping aspiring hop growers get started. Purdue’s Hop Yard. The Boiler Hop Yard, located at the Meigs Horticulture Research Farm south of Lafayette, IN serves as a research and demonstration plot. Two trellis systems were erected last spring: the more common 18+ft trellis and a shorter 10-ft “dwarf” trellis. Dwarf trellis systems offer a potential advantage to smaller-scale hop growers because of lower management and input costs. Although costly (roughly $10,000 an acre) and labor intensive, a well-constructed trellis system can last for over 10 years. The Boiler Hop Yard is home to several varieties of hops including Cascade, Centennial, Nugget, Chinook, Galena, and Zeus. These varieties were chosen for several reasons. First, they are publicly available – meaning that they are available for any aspiring hop farmer to plant. Second, these varieties are popular among the industry, and already had a presence in Indiana hop yards prior to establishment of the Boiler Hop Yard in 2014. Lastly, these varieties are expected to be the most adaptable to Indiana’s climate, and some are likely to perform well in dwarf trellis systems. Purdue’s outreach activities. Purdue is hosting several events to help Indiana’s established and aspiring hop growers get started and optimize production. This included a workshop at the recent Indiana Small Farms Conference. Representatives from different departments in the College of Agriculture, as well as visiting scholars from the University of Vermont and the University of Minnesota were on hand to give presentations and answer questions about the crop and the industry. Topics covered included trellis construction, practical pesticide use, food safety awareness issues, insurance for specialty crops, insect suspects in Indiana’s hop production, as well as information about how important it is to secure legitimacy in a new and expanding market. Over 100 people were in attendance. Copies of the presentations can be found on Purdue’s hop website along with links to webinars and other resources for hop growers. ag.purdue.edu/hla/Extension/Pages/Hops.aspx. The next outreach activity will be held at the Boiler Hops Yard sometime in late July or early August when the hops are getting close to harvest. Details will be made available on Purdue’s hop website. Figure 1. Hop yards in Indiana.